DSNews delivers stories, ideas, links, companies, people, events, and videos impacting the mortgage default servicing industry. 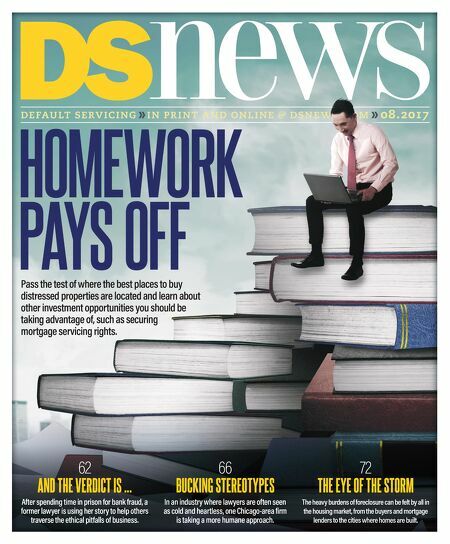 default servicing in print and online @ dsnews.com 08.2017 HOMEWORK PAYS OFF Pass the test of where the best places to buy distressed properties are located and learn about other investment opportunities you should be taking advantage of, such as securing mortgage servicing rights. 62 AND THE VERDICT IS ... After spending time in prison for bank fraud, a former lawyer is using her story to help others traverse the ethical pitfalls of business. 66 BUCKING STEREOTYPES In an industry where lawyers are often seen as cold and heartless, one Chicago-area firm is taking a more humane approach. 72 THE EYE OF THE STORM The heavy burdens of foreclosure can be felt by all in the housing market, from the buyers and mortgage lenders to the cities where homes are built.